About 15 years ago at Daytona International Speedway, I heard the late great Dale Earnhardt tell a throng of us media types what the difference was between a winning team and a second-tier one. What Earnhardt was basically doing was laying out the blueprint for champions and describing how some teams routinely come up short. Hey, a seven-time champ was talking, so it was well worth the listen to get his perspective. The salient point of Earnhardt’s theory – and when he held court, he truly was running the show – was that it’s easy to earn championship points when you have a car capable of running in the top five. It’s even easier to hoist a trophy as a race winner, but those days pretty much speak for themselves – a great driver and a super-fast car leaving the competition in the mirrors and racing to the checkers. However, he went on to say that it’s really not what winners do on those memorable days, it’s how they perform in races when they don’t have their best equipment. The true gains, he acknowledged, were when he took a car that should have finished 20th or worse and clawed his way into the top 10, turning a potentially disastrous, championship-ruining day into a respectable one. Earnhardt was saying it all comes down to how a driver, team or players perform when they don’t have their A game. Despite riding a 4-game winning streak as the puck dropped in Ottawa against a reeling bunch of Senators, Florida didn’t have their A game early. Florida failed on early offensive chances to beat ex-Cat Craig Anderson, who has struggled like every netminder has for Ottawa. Florida’s defense also put hot goalie Scott Clemmensen in a perilous predicament or two when the Sens put together a couple of 2-on-1 rushes, but Clemmensen was up to the task. When the first 20 minutes were over, Florida had been outshot 14-9, something that hasn’t happened to them often lately. Though they weren’t playing at the level they did against Washington, Montreal and Toronto, Florida kept grinding. Aleksander Barkov tipped in a shot from Tom Gilbert for the second period’s only goal, and when the horn sounded, Cats’ fans had to like their chances of being tied with the Senators and Anderson (who came in 10-1-1 against his old team) in Ottawa, where the Sens have owned Florida lately. Florida (14-17-5) took over in the third period, and while I’m sure many will point to Ottawa having playing in New Jersey the night before, the Panthers deserve all the credit and then some because they really had to earn it. They killed off a tripping penalty by Erik Gudbranson, then found themselves on the power play when Jean-Gabriel Pageau high-sticked Dylan Olsen with 4:30 left to play. One of the great mysteries of the game was how Pageau didn’t get a double-minor when Olsen was clearly cut on the forehead and the defenseman went up to the referee to show him. The end result: Gilbert bailed out Florida’s anemic power-play with a blast past Anderson, and Kopecky later put the game away with the club’s first shorty this season. Simply, the Panthers fought and fought all night in Canada’s capital – through the fatigue of a weary road trip in bitter cold, against failed opportunities, against an overturned goal and a missed penalty by Ottawa that would have sealed a win with another goal or at least taken more time off the board. Despite all of that, the Panthers won their fifth straight, have taken seven out of eight, and certainly arrived in brutally freezing Winnipeg with the warmth of confidence to rely on. They overcame and persevered in Ottawa. That’s what Earnhardt was describing and what the Cats were able to do. SUNRISE — Florida Panthers goaltender Jacob Markstrom showed the New York Rangers a glimpse of what they can expect in future divisional play, halting the Blueshirts’ quest for a playoff spot in the process — for now. Markstrom stopped 36 shots, and Tomas Fleischmann, Marcel Goc and Drew Shore scored goals to help the Panthers break a six-game losing streak and get past the Rangers, 3-2, in front of 17,758 fans at BB&T Center on Tuesday night. Following a scoreless first period in which Florida (14-26-6) was outshot 10-2 by the visiting Rangers, Filip Kuba’s shot from above the left circle was tipped by Fleischmann at 5:04 into the second period, resulting in the Czech winger’s 10th goal. Defenseman Mike Weaver also recorded an assist on the play, and the Panthers held a 1-0 advantage after 40 minutes. “We know the Rangers focus on blocking our shots so we’re not trying to mess around with it on the blue line. I had a good screen and maybe Fleischmann tipped it, I’m not sure,” said Kuba, who was originally credited with the goal, following the second period. After Taylor Pyatt was awarded a goal when his shot was accidentally kicked in by Colby Robak, Florida defenseman T.J. Brennan jumped up after a loose puck, forcing New York’s Brad Richards to commit a tripping penalty as Brennan broke into the Rangers’ defensive zone. Florida went on the power play, and Goc, standing in the slot, broke the 1-1 tie by redirecting a pass from Fleischmann past New York goalie Henrik Lundqvist for his eighth goal with 7:37 left. Drew Shore broke a 22-game streak without a goal, including 18 without a point, by scoring shorthanded and into an empty net with 1:23 remaining in the game, his third tally. With Lundqvist pulled in the last minute of play, New York watched newly acquired center Derick Brassard cut the lead to 3-2 with 32.9 seconds left. However, Florida fought off a pair of good attempts by New York in the closing seconds to preserve the win. Florida has two games remaining and still sits in last in the league’s standings. A loss to either Toronto at home on Thursday or in Tampa on Saturday in the season finale would slot the Panthers with the best chance of securing the top overall pick and assure them of picking no worse than second in the June 30 draft in Newark. The Rangers (24-18-4) outshot Florida 38-16 but wasted a chance to clinch its third straight playoff appearance and are just one point ahead of Winnipeg, who lost 5-3 in Washington. The Jets have one game remaining, at home against Montreal, while New York travels to Carolina on Thursday and rounds out the season at home against New Jersey. The Rangers and Ottawa Senators are tied for the final two playoff spots in the Eastern Conference, with the Jets just the one marker in arrears. 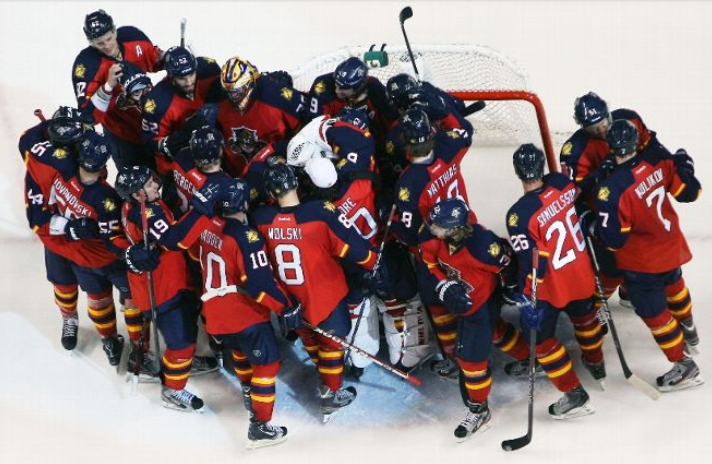 Florida won the season series 2-1 from the Rangers, also beating them 3-1 behind Markstrom on March 21. New York defeated Florida 6-1 last week.